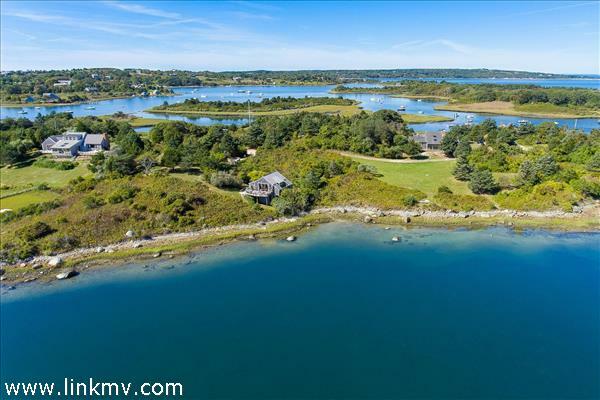 Spectacular 3 home waterfront Chilmark estate on 5.8 acres with private dock on Stonewall Pond. Breathtaking one-of-a-kind views across Stonewall Pond out to the Atlantic from all 3 homes as well as stunning views of Quitsa Pond. Each of the homes is charming and beautifully maintained, with its own Vineyard history. "Lorca" has an open kitchen/dining/living area with intimate views overlooking the water. Exposed brick walls in the kitchen, living room and master bath add to its charm as do saltillo tile floors. There is a separate family room with fireplace and views of Quitsa Pond. An expansive deck off the back of the home offers room for outdoor dining and for taking in the full beauty of this incredible property. There is also a first floor master bedroom with private bath and a second bathroom off family room. Washer/dryer is off the kitchen. Amazing views of Stonewall Pond, the Atlantic Ocean and Quitsa Pond throughout. Two additional bedrooms. There is a widow's walk with 360 degree views. Partial basement and crawl space. Each home has its own parking area. Yard Type: Private and beautiful natural landscaping.